Pressure to follow public opinion couldn't get much stronger. 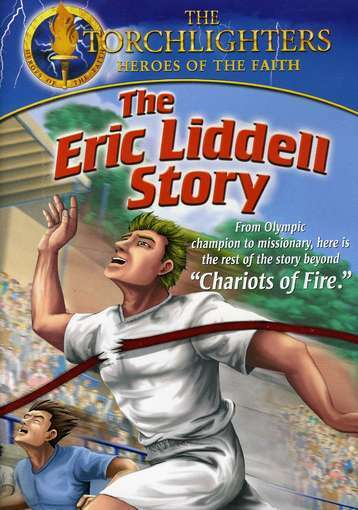 National hero Eric Liddell is Scotland's pride and joy. The entire country is eager for their running celebrity to sprint past the rest of the world and bring home Olympic gold in the 100-metre race. But when Eric makes the stunning announcement that he won?t race on Sunday because of his religious convictions, he is soon labelled a disgrace and a traitor. See how Eric Liddell's famous stand during the 1924 Olympics prepares him for even greater challenges as a missionary to China during World War II. Torchlighters is a series of animated programs for youth ages 8-12, presenting the lives of true-life heroes from Christian history. When kids see what God can do through a 'Torchlighter' who is devoted to carrying out His will and purposes, they too may want to carry a torch of faith by serving Him. For more information on the series, visit www.torchlighters.org. Torchlighters: The Eric Liddell Story DVD by Torchlighters was published by Vision Video in September 2007 and is our 5243rd best seller. The ISBN for Torchlighters: The Eric Liddell Story DVD is 727985011271. Be the first to review Torchlighters: The Eric Liddell Story DVD! Got a question? No problem! Just click here to ask us about Torchlighters: The Eric Liddell Story DVD. A:This DVD is region free and should be fine to play on most DVD players. Thank you for using the Q&A Forum.